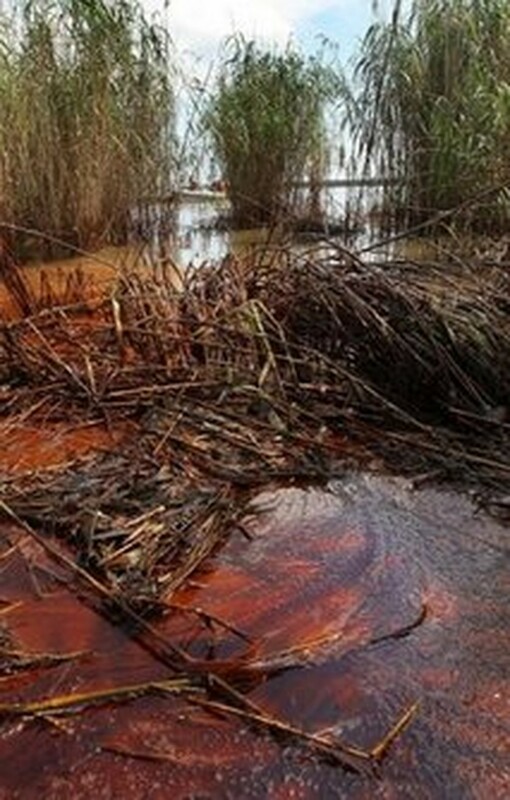 (AFP/Getty Images) Oil oozes through the reeds at the mouth of the Mississippi River on May 17, 2010 in near Venice, Louisiana. NEW ORLEANS, Louisiana (AFP) – The US interior secretary faces lawmakers Tuesday over a huge and growing Gulf oil spill that engineers are struggling to control and now threatens Florida's coral reefs. As political fallout from the spill grows, sources said President Barack Obama would appoint an independent commission into the disaster, and an official at the federal agency that regulates drilling stepped down. BP has begun siphoning some of the oil leaking from a ruptured well pipe via a so-called insertion tube up to a container vessel. But the fix is containing only about 20 percent of the flow, which experts warned could soon be drawn into a current that would take it up Florida's coast, threatening fragile coral reefs, marine life and beaches. On Tuesday, Secretary Ken Salazar was to be grilled by US senators as the administration sought to show it would get tough with those found responsible for the oil spill. An administration official said Obama would establish an independent commission in coming days, supplementing government inquiries into the major environmental disaster. The spill appeared to claim its first political casualty, with the announced retirement of Chris Oynes, who oversaw offshore energy for the Minerals Management Service. The federal agency has come in for scathing criticism over the enforcement of safety standards for offshore drilling. Last week Obama slammed MMS as being too "cozy" with the companies it regulates, and ordered "top to bottom" reform of the agency after allegations it allowed BP and other firms to drill in the Gulf without the required permits. BP, which leased the rig that exploded and sank last month, prompting the disastrous spill, says that a fifth of the flow is now being sucked up by an insertion tube. The British energy giant said it was gearing up for an operation to inject tonnes of heavy drilling "mud" into the well to staunch the flow before permanently sealing it with cement. "Our next effort to try to stop the flow will occur later this week or early in the weekend coming up and it's the top kill procedure," said BP chief operating officer Doug Suttles. "If that's successful we would be bringing this incident to a close." BP's first claim of success in tackling the spill risked being overshadowed by fears that the oil continuing to gush into the Gulf could be drawn into a powerful sea current. That could shift parts of the toxic slick towards Florida, wreaking havoc on the fragile coral reefs and nature preserves of the famed Florida Keys. There are also concerns that huge underwater plumes of crude could be starving the sea of oxygen. A research vessel has located plumes reported to be up to 10 miles (16 kilometers) long, three miles (4.8 km) wide and 300 feet (92 meters) thick that suggest a far greater impact on the marine environment than previously thought. "BP is burying its head in the sand on these underwater threats," said Democratic congressman Ed Markey. "These huge plumes of oil are like hidden mushroom clouds that indicate a larger spill than originally thought and portend more dangerous long-term fallout for the Gulf of Mexico's wildlife and economy." "Normally, in a shallow spill, everything pretty much shoots up to the surface and the impacts are primarily to surface organisms like turtles, dolphins, whales and birds," explained Paul Montagna. "What happens is we're dealing with a different kind of situation than the past because under this really cold, high-pressure environment the oil is getting dispersed through the water column," he said. Response crews have used some 560,000 gallons of controversial chemical dispersants, spraying them onto surface oil and also directly into the leak in a bid to break up the oil. With an estimated 5,000 barrels, or 210,000 gallons, of oil spewing into the Gulf every day, BP was keen to celebrate placing the insertion tube into the main leak. The operation, conducted by robotic submarines, allows some oil to be siphoned via a mile-long pipe to a drill ship on the surface. Suttles said he had flown over the slick Monday morning and seen "a big difference," witnessing "probably the smallest amount of oil I've seen on the surface since the effort began."